fourwhitepaws: more awards for me! Wow, I'm thrilled to have recently picked up another two awards to add to the collection! First, Random Felines graciously bestowed the Sunshine Award to me back on the 24th! Thank you so much!! 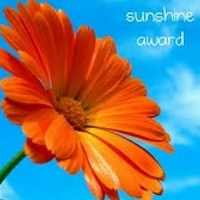 With all the cloudy skies we have had lately, I'm hoping this Sunshine Award will make all those pesky clouds go away! With the Sunshine Award comes seven questions that must be answered. I hope I get these questions right because I would hate to have to return the award. So, you gotta answer 7 questions and then pass it on (and let them know they gotted it). hmmm... I'll have to go with seven. 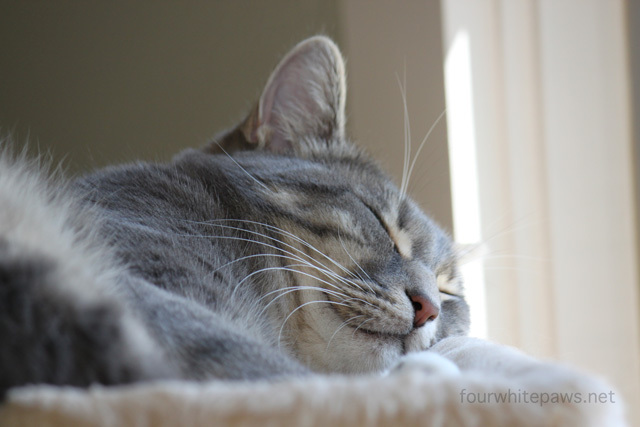 Our hobby cattery license allows us to have seven cats. We only have six so far on the license (Oliver is a mostly outdoor cat but I went ahead and got him licensed, so he's officially mine!) So, as I see it, we got room for one more! Tall soy mocha, no whip. Question 3: Facebook or Twitter? Just facebook, twitter seems stupid. Not a huge fan of facebook either. Silly question, cats of course! I love kitties, kittypets and ferals alike. Any day that doesn't involve work! Now comes the fun part, I get to spread some Sunshine to some other great bloggers. FosterKittenCam, The Scientist Kittens - ok, this technically is not a blog, but watching the kittens and mama has brought a huge amount of Sunshine to my life! Who can resist watching ginger kittens?!?! The Itty Bitty Kitty Committee - I must be in the mood for kittens! The amazing people at IBKC just raised over $75,000 for the cats at their local Humane Society! Awesome! Cat Tee Mission - formerly known as the Purr Diaries, the blog was relaunched as part of the Cat Tee Mission, which is a great fundraising idea. Sarah creates fun original tee shirts which are available for purchase and all profits go to help cats!! And if the Sunshine Award wasn't amazing enough, I was also recently given the Versatile Blogger Award by Sarah at Three Cats and a Girl! Wow! Thank you Sarah! Goodness, I digress, Willow will do that! 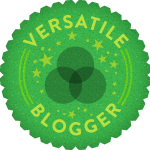 So, the Versatile Blogger Award comes with some rules. Nominate 5 fellow bloggers who are relatively new to blogging. Let the nominated bloggers know they have been nominated for the award. Add the Versatile picture to your post. I'm gonna go out of order with the rules, hopefully this doesn't invalidate my Versatile Blogger Award! I'll start with seven random facts about myself. I've got a thing for Willow! I once worked on an island paradise in the middle of no-where! It was the best! The first 30 years of my life I was a strict dog-person, and never even dared touch a cat. Thankfully my friends Tom and Sarah worked an intervention and set me straight. The briefest job I ever held was for only 5 hours. I couldn't even make myself get through the entire first day. Since I was the only one in the office when I quit, I had to leave a note for the boss telling him I was done. I was a DJ at the college radio station. Forget the printing press, the lightbulb and the sewing machine, flannel lined jeans are the best invention of all time! Roger Water's The Wall is music for my soul. I can't count to seven! Cat With A Garden - now, this blog is not new, but Siena hasn't posted in quite a while, so maybe this award will spur a new update! Siena is a gorgeous fluffy Norwegian Forest Cat. Mr. Puddy - again, not a new blog, but with Mr. Puddy's recent return from a long absence, it's like a new blog! Since my first cat was a floofy black and white, I'm a sucker for floofy tuxedos! Frank's Corner - another fluffy kitty! (are you detecting a theme here?!) It's been ages since Frank has posted any updates. Frank's blog doesn't have many followers, so it qualifies as relatively new. Tails from the Foster Kittens - Connie has lots and lots of great pictures of her kitties and her fosters. For some reason I'm partial to Fleurp. The Maple Syrup MOB - Jane and Chris's blog certainly qualifies as Versatile, as they cover many of their great adventures, whether working on a new deck or visiting the fun art installation in town - oh and plenty of kitties sprinkled in too! Thanks again to Random Felines and Three Cats and a Girl! concats on both awards. love your answers. :) Gonna have to go visit some of those blogs that we haven't heard of before. Congratulations! I do enjoy your blog. SO sad that you can't eat cheese. I have a number of favorites! LOVED reading your answers to questions, Loved it. Congratulations! I am following you now! Congrats on your awards! BTW, Nahum and Theo made the finals of the Synchronized Snoozing competition! Congrats!! Congratulations on all your awards!! Good job! afternoon drama and EBK gets a name!